Cindy Briggs & Theresa Goesling Sample Watercolor Travel Set. Keep it simple, carry less and paint more. CINDY & THERESA’S BASIC STUDIO & TRAVEL SUPPLY LIST You can always use supplies you already have. Our favorite and highly recommended items are in bold. Just be sure to have professional quality paper, paint, a good brush, pencil and kneaded eraser. We share the list of tools we use to help you decide what you might add to your artists’ toolkit. If this is a studio class, please bring your own reference photos – we usually provide something but it’s more meaningful if you use your own. TRAVEL JOURNALS FOR JOURNAL & TRAVELING WORKSHOPS: We suggest a Watercolor Journal with Arches or Fabriano with 140lb cold press paper (size such as 7×10 or 10×14) Pick a size that feels right for you. PAPER FOR STUDIO & TRAVELING WORKSHOPS: For single sheet painting we like 140 lb Fabriano Extra White Cold Press Block (purple cover) or minimum 1/4-1/2 sheet of 22×30 300lb or 140 lb Fabriano Soft Press per day, clip or tape to gator board. Bring a few pieces of scrap paper to practice mixing colors. 140 lb to 300lb Arches Cold Press is also fine. You deserve a professional quality paper, student grade papers make it harder to paint. A watercolor block is also a good choice for both studio and traveling workshops. FLAT BRUSH 1/2“ or 3/4” Flat with a dagger end for scratching. 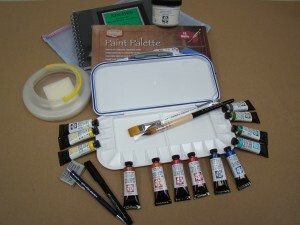 Here’s a link to purchase the Watercolor Quill Brush in a special package at www.TheBrushGuys.com. We have also found the brushes at Daniel Smith Stores and sometimes on Amazon. .
Faber Castell Water-fast Artist Pen(s), Black and/or Sienna fine pt. plus, medium, brush pt. Glue Stick Acid Free – to glue items into your journal. Color Wheel (DS—the Color Wheel Company) Great for helping you plan your color strategy. Mr. Clean Magic Eraser—no soap version available at grocery stores. Always fun to have stencils, stamps, collected tickets and brochures for journaling classes. Reference Photos for Studio Workshop – Always bring related or range of subjects. Daniel Smith Watercolor Ground for decorated cover base—easiest to design & paint before or after trip, then varnish. Link here for step by step directions. Daniel Smith Watercolor Ground is also helpful for corrections. Use a foam brush to apply. Lightly sand. Varnish with Golden’s Archival Satin Varnish after you have completed your painted or collage design. PROFESSIONAL QUALITY DANIEL SMITH WATERCOLORS (In a tube) Bring your palette as is and add colors as you see fit. Many of our Daniel Smith colors are standard to most workshops and have different hue names by other makers such as Winsor Newton or Holbein. Our Easy Travel & Jounal Kit: Colors suggested for kit are in bold, colors are listed in the order we recommend placing in your palette. Titanium White, Lemon Yellow, Naples Yellow, Quinacridone Gold, Yellow Ochre, Italian Burnt Sienna, Pyrrol Orange, Cadmium Red Hue, Quinacridone Rose, Imperial Purple, French Ultra Marine, Phthalo Blue Green Shade, Magnesium Blue Hue, Cobalt Teal Blue. Diopside Green, Green Apatite Genuine, Rich Green Gold, Neutral Tint. Extra Fun to Have Very Optional Palette Colors: Select Daniel Smith Watercolors we may have in our 33 well bullet proof palette. Venetian Red, Lunar Earth, Cobalt Turquoise, Permanent Brown, Titanium Buff, Rose of Ultramarine, Manganese Violet, Malachite Genuine, Phthalo Yellow Green, Cadmium Yellow Medium/Light, Cobalt Violet, Permanent Brown, Quinacridone Coral, Permanent Magenta, Sepia, Cadmium Orange, and NEW colors we are excited about for France and upcoming workshops: Lavendar, Wisteria, and Lilac.